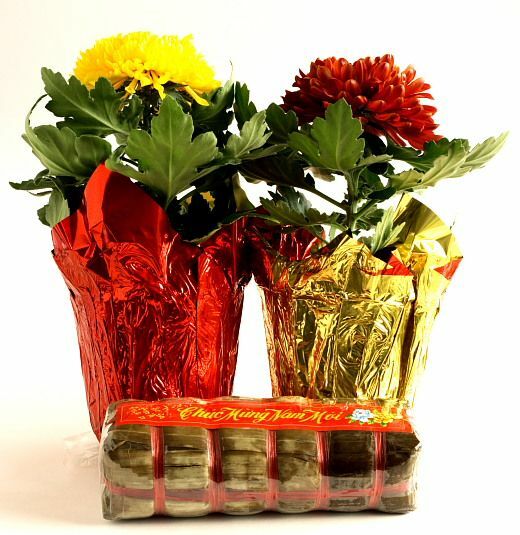 Today is Valentine's Day and Tết (the Vietnamese New Year)! 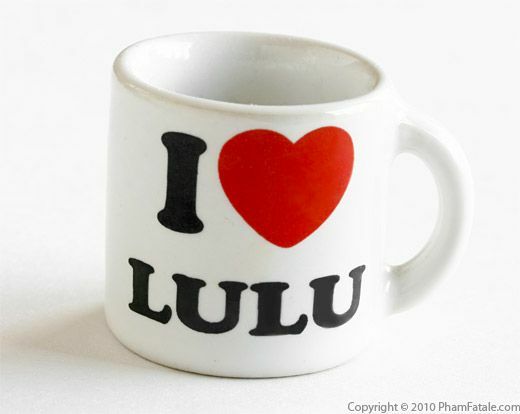 First, I want to tell my husband Lulu how much I love him. We've known each other for more than 10 years now, married for 5 and I look forward to spending more years of blissful happiness with the love of my life. Joyeuse Saint-Valentin mon coeur! If you're wondering what the inscription on the photo is, it says "Chúc Mừng Năm Mới" or Happy New Year in Vietnamese. This year, since the Asian New Year follows the Lunar calendar, we have 2 celebrations at the same time: Valentine's Day and Tết (the Vietnamese New Year). We're going to be celebrating a romantic Lunar New Year of the Tiger ! I've started decorating the house with things that symbolize the New Year. I went to San Jose and bought Vietnamese flowers called bông vạn thọ, which literally translates to "longevity flowers". As usual, every year, I'm on a quest to find the best bánh tét. 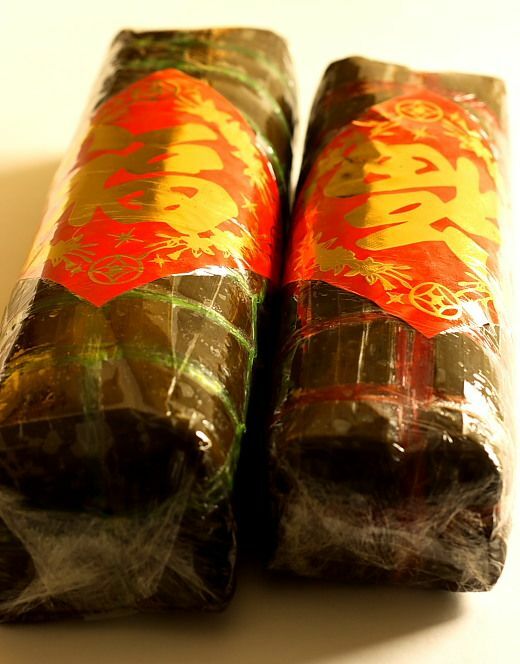 It's a must to have traditional food for Vietnamese Lunar New Year. I went to several different stores on Tully road (San Jose, California) and I'll give you the results this weekend of the best places I've found. 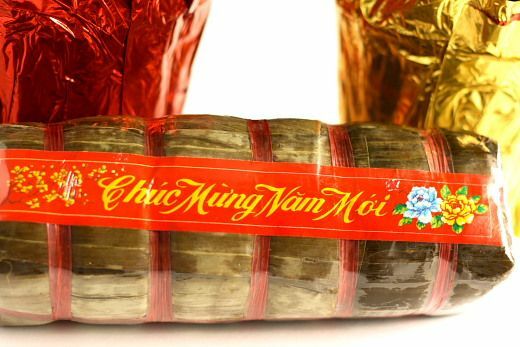 Some of you might not know what a bánh tét is; it's a ake roll made from sticky glutinous rice and red beans with a center of mung bean paste with or without meat. 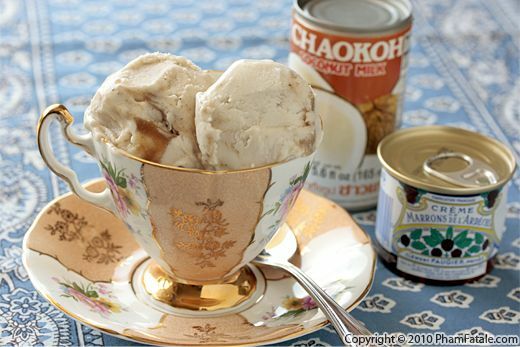 The flavors vary; there could also be bananas in place of the lentils and meat. If you are observing the tradition of eating vegetarian foods (ăn chay) on the last day of the previous year and first day of New Year, check out my tofu recipes. For more details about Chinese New Year celebrations, check out last year's post. Bánh Tét (Sticky rice roll cakes wrapped in banana leaves). The whole family went last weekend to our favorite dim-sum place and we had a sweet coconut red rice soup with corn for dessert. I've probably said it before, but Asian desserts are not always the most glamourous-looking sweets. Looks can be deceiving though, and the girls love it so much that they asked me to make it at home. Give it a try! Page 2 of 5 pages.